In baseball and softball, a relief pitcher or reliever is a pitcher who enters the game after the starting pitcher is removed due to injury, ineffectiveness, fatigue, ejection, or for other strategic reasons, such as being substituted by a pinch hitter. Relief pitchers are further divided informally into various roles, such as closers, set-up relief pitchers, middle relief pitchers, left/right-handed specialists, and long relievers. Whereas starting pitchers usually rest several days before pitching in a game again due to the amount of pitches thrown, relief pitchers are expected to be more flexible and typically pitch more games but with fewer innings pitched. 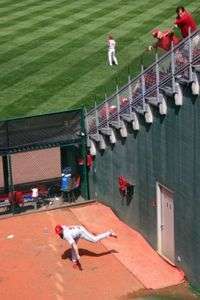 A team's staff of relievers is normally referred to metonymically as a team's bullpen, which refers to the area where the relievers sit during games, and where they warm-up prior to entering the game. The setup man and closer will normally only be used to preserve a lead. If the team is significantly behind going into the eighth or ninth inning and a relief pitcher is required, usually a middle reliever or two will be chosen, while the setup man and closer are saved for the next time they are needed to preserve a win. In games where a blowout is occurring, position players (non-pitchers) may be substituted in to pitch to save the bullpen for the next game. However, this is a rare occurrence as position players are not truly trained as pitchers, and tend to throw with less velocity and/or accuracy. There is also the increased risk of injury, such as Jose Canseco who suffered a season-ending arm injury after pitching 2 innings in a 1993 game. For these reasons, managers will typically only use a position player as a pitcher in a blowout loss, or in order to avoid a forfeit once they have run out of available pitchers. Cliff Pennington became the first position player in Major League Baseball history to pitch in a postseason game, which was during Game 4 of the 2015 American League Championship Series. Compared to starting pitchers, most relievers (with the except of closers with large save totals) receive few awards and honors. Some setup men who have been selected to Major League Baseball All-Star Games include Brendan Donnelly, Hideki Okajima, Carlos Mármol, Mike Stanton, Jeff Nelson, Arthur Rhodes, David Robertson, Tyler Clippard, Hong-Chih Kuo, Brett Cecil, and Steve Delabar. A setup man has never won the Cy Young Award or the Major League Baseball Most Valuable Player Award; the highest placements in these respective awards have been achieved by Mariano Rivera who finished third in the voting for the American League (AL) Cy Young Award and twelfth for the AL MVP in 1996, and for the next season he was promoted to closer. Setup pitchers typically make less than the MLB average salary. Five pitchers are currently in the Baseball Hall of Fame chiefly for their accomplishments as relief pitchers: Goose Gossage, Hoyt Wilhelm, Rollie Fingers, Bruce Sutter, and Dennis Eckersley. Eckersley, who was considered the first modern closer pitching exclusively in ninth inning situations, also had a significant career as a starting pitcher and even threw a no-hitter in 1977. Another pitcher entering the Hall in 2015, John Smoltz, was primarily a starter, but spent four seasons as a reliever. ↑ Zimniuch, Fran (2010). Fireman: The Evolution of the Closer in Baseball. Chicago: Triumph Books. p. 6. ISBN 978-1-60078-312-8. ↑ Kull, Andrew (April 1985). "Baseball's Greatest Pitcher". American Heritage. Retrieved October 20, 2016. ↑ Garro, Adrian (June 28, 2016). "It's a Maddon world: Three pitchers played left field for the Cubs, and it worked". MLB.com. Retrieved October 21, 2016. 1 2 Passan, Jeff (April 26, 2010). "Should managers play Scrabble with relievers?". Yahoo! Sports. Archived from the original on January 22, 2012. ↑ Brisbee, Grant (October 20, 2015). "Blue Jays' Cliff Pennington becomes first position player to pitch in the postseason". SB Nation. Retrieved October 21, 2015. ↑ Rancel, Tommy (June 24, 2013). "Set-up guys who would be worthy All-Stars". ESPN.com. Archived from the original on October 11, 2014. 1 2 "1996 Awards Voting". Baseball-Reference.com. Retrieved March 28, 2011. ↑ Zimniuch, Fran (2010). Fireman: The Evolution of the Closer in Baseball. Chicago: Triumph Books. pp. 154, 168. ISBN 978-1-60078-312-8. ↑ Felber, Bill (2006). The Book on the Book: An Inquiry Into Which Strategies in the Modern Game Actually Work. St. Martin's Griffin. p. 102. ISBN 978-0-312-33265-5. Retrieved January 5, 2011. ↑ Baseball Explained by Phillip Mahony, McFarland Books, 2014. See www.baseballexplained.com.